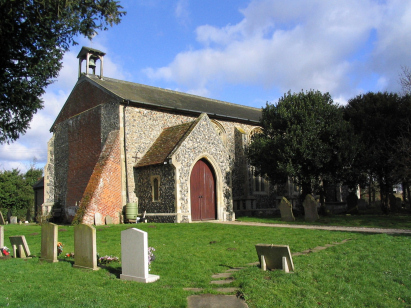 The parish of Burston lies in southern Norfolk, just northeast of the market town of Diss and west of the A140 road which links Norwich to Ipswich. Burston lies on a broad flat agricultural plain to the north of the Waveney valley and lying about 40 metres above sea level. The area is intensively agricultural and is crossed only by wandering lanes and the incongruously straight route of the main Norwich to London railway. Burston would have lain in obscurity if it were not for its controversial history of industrial activism. Its village school was the scene of a political scene changing strike, notoriety which scarcely fits this tranquil rural idyll. The "Strike School" is now quite a local tourist attraction commemorating the once industrial struggle. St Mary's church sits adjacent to the main village crossroads, it is bereft of its tower which sadly collapsed in 1753 and was never rebuilt. 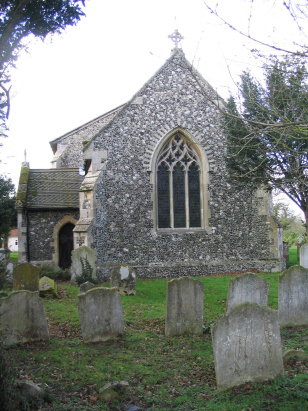 From external appearance the church appears to be Victorian, however these later changes mask what is inherently another Norfolk church from the late Perpendicular period. The restoration of the Victorian period not only revitalised much of the church it also completely replaced the Chancel and vestry. The church is very much the focus of the village and despite its former towered glory still dominates Burston. Two standard 800-entry register books cover the period of the transcript, the first covering 1813 to 1875, the second continuing beyond the end of the transcript period until completion in 1900. Both register are filmed on Microfilm MF1371 in the collection of the Norfolk Record Office and from which this transcript was prepared. Both films are relatively recent filmings and as such are of a good quality. As a result this was a straightforward transcript to prepare, whilst there are always badly written entries at times the majority were legible and there should be few errors which have crept in.